When you’re looking for a pre-owned vehicle that won’t let you down, Baie-Comeau Mazda is here to help. At Baie-Comeau Mazda, we offer an extensive inventory of pre-owned Mazda vehicles at the best price, including SUVs! We offer compact vehicles, sport utility vehicles, coupes, and roadsters to augment your driving pleasure. All our pre-owned vehicles are inspected by competent technicians to ensure the quality of every model. At Baie-Comeau Mazda, you’ll feel safe driving off in your new vehicle. We’re committed to answering all your questions in a clear and professional manner. We believe that offering better service to our customers makes it more likely that we gain a customer for life. You can rest assured that we’ll do everything we can to go above and beyond your expectations. When you visit Baie-Comeau Mazda, you’ll discover a vast inventory of pre-owned Mazda vehicles that will meet all your expectations. Our inventory of pre-owned vehicles is continually renewed, so we’re sure to have the right model for you. When you come to Baie-Comeau Mazda, you’ll find the pre-owned vehicle that suits you best. In addition, our experts will help you find the right financing plan for your budget. We’ll help you find the solution you need at a great rate. 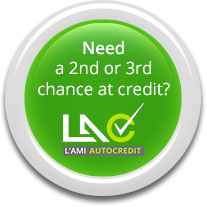 We also provide plenty of affordable second chance credit solutions designed to get you back on track. Discover the perfect pre-owned vehicle for you today!